Don’t we all have days where our minds are bombarded with stimulation? One cannot help but wonder if this level of redundant stimulation in everyday life has always been considered normal or whether it is unique to today’s society. The answer may be unclear but what it yields to is pretty obvious: choked up nervous systems; resulting in decreased life quality. As a result of over-stimulation, we either find ourselves possessing too much energy that our bodies and minds could handle. Or with no energy left at all, as if our life light has been sucked, leaving us with the feeling of an empty-shell. Chemicals, drugs, coffee and sports training are ingrained approaches encouraged by Western medicine tradition to handle with imbalanced life energy. They all are different but at the same time analogous tools, and there is a scientific explanation behind it. These tools are argued to originate from the dominant reductionist approaches, which pre-accept that illnesses result from a biologic defect or pathogen. So, an energy imbalance that discomforts our everyday life, is not qualified as a disease to be addressed by Western medicine traditions, unless an underlying somatic effect exists. Fortunately, it is also our societies that have begun to see the inefficiencies of these tools and to realise the healing power of ancient Indian practices. As you have probably heard before, the main difference of such practices is hidden in their holistic approach towards human existence. Treating the mind, soul and the body as a whole. Yin Yoga is one of the most underrated yoga practices in its ability to destress and declutter the mind. Yin Yoga originates from the Taoist concept of Yin and Yang, which presents opposite and complementary elements in nature. Yin embraces stillness and non-reactivity. Having combined patience, flexibility, and equanimity as its essential elements, Yin Yoga takes things nice and slow. If you have ever experienced a Yin Yoga practice, you’ll know how important holding long postures (for five to 20 minutes) is. It is through these postures that Yin Yoga spreads therapeutic vibes. Those gentle pigeon postures, forward bends, and lunges are there to invite you to test your patience, to encourage to raise your consciousness, and to assist to empty your mind. Concentrating on your breath opens up a reality where you can allow any thought patterns to arise, to observe them, and then let go without getting involved. Experiencing a posture at its fullest to switch to the next posture in a few minutes, lights your way to realise how serene stretching can be. Regular Yin Yoga practicing is reported to release the body into the parasympathetic nervous system on a mental and emotional level, which is a spectacular revitalisation. Negative energy does not manifest itself only in mind, but also in body. That is why deep stretching and breathing help you to release not only your tissues, but also energy around it. From head to spine, every different part of your body is known to coincide to different energy wheels. These energy wheels are described as “chakras” in the Sanskrit language. Each chakra vibrates at a different periodicity, refers to a particular colour, associated with a functionality of a specific organ. The identification of chakras paves the way to clean the blocked energies that may be collected in our bodies. When cleaned of blocked energies, chakras become balanced, and the energy begins to flow freely. As a result, your circulation improves, flexibility improves, mind, body and soul get balanced. Less stress, more focus? Sign me up! A range of unique Yin Yoga classes are offered at The Conscious Club. Yin Yoga, Ying/Yang, and Yin Restorative run regularly and are open to people at all levels. You can read more about these classes here. Tickets for our regular classes can be purchased here. We also have a range of special classes that are available once a month. These classes expand on the practices we offer on a regular basis, giving you the opportunity to dive deeper into the classes you love. 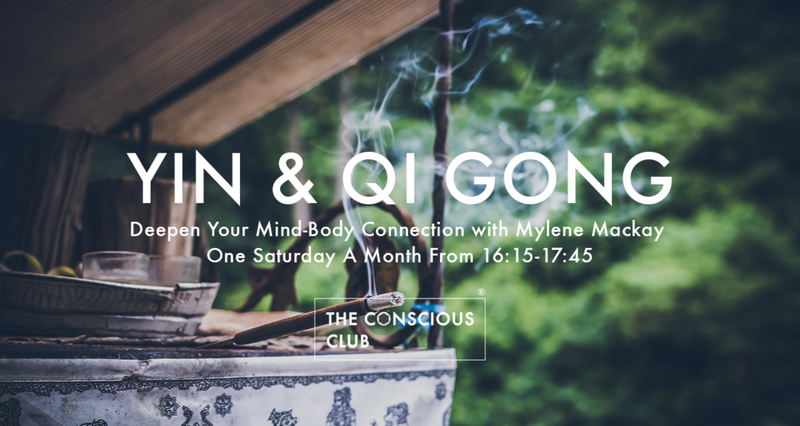 This Saturday 7 April we have a Yin & Qi Gong class at 4:15pm. Yin Yoga and Qi Gong are not like other workouts. While a long swim or jog might leave you feeling drained, ancient mind-body practices like these have the power to do just the opposite. They produce more energy than they consume. When we practice Yoga or Qi Gong, we feel calm, invigorated, and clear-headed. We experience a sense of renewal on all levels. We also have a beautiful Hip Openers class that focuses on Yin Yoga running this Saturday 7 April at 2:00pm. Hip openers might not be your favorite thing to do. It can be quite intense, and it might be even more intense in a Yin practice. Yoga is not always comfortable the moment we are in the poses. In this special hip openers yin class we explore the hips in a yin way: really slow and subtle. We focus at the pelvis area for grounding, with opening poses. We will search our edges and we might want to take it slow. We do not only play our physical edge in yoga, but certainly also our emotional and mental edge. To eventually release every tension in this area. If you you have not practiced yoga before, let Yin Yoga be your starting point. It is one of the warmest gifts you can give to your mind, body, and soul! If you have previously practiced yoga, we recommend giving Yin Yoga a go. It may be your next chance to challenge yourself, and stay consistent to your principle of trying new things throughout your own yoga journey. No matter where you view yourself to be in your yoga journey, there is definitely something to learn from a Yin Yoga practice!